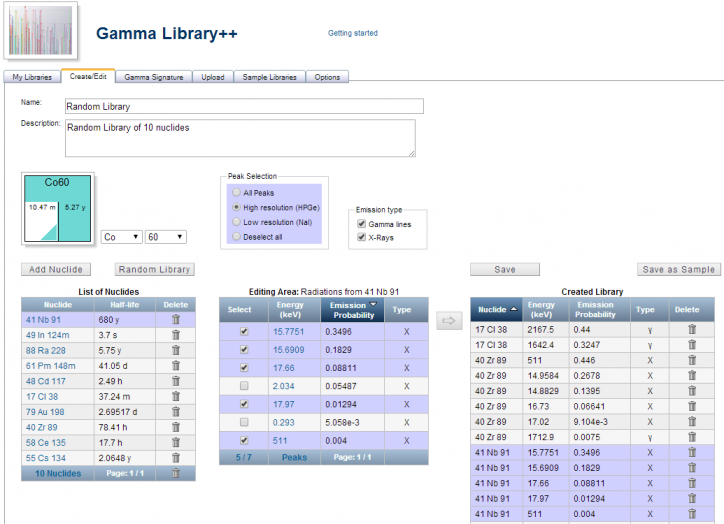 – the Options tab has been extended and allows the user to a) choose the nuclaar data library to be used (currently JEFF3.1 and 8 TORI), b) show the uncertainties in the energies and emission probabilites, c) select a format for library downloading (Genie 2000, GammaVision, Identify, xml), d) set rules for peak selection for high and low resolution detectors. – a new paging feature has been introduced for better management of nuclides and mixtures. When the numbers of nuclides in a mixtures is greater than about 20, this new feature allows the user to scroll through the component nuclides by paging. Also when the number of nuclide mixtures is greater than 20, paging can be used to scroll through the entire list of mixtures. 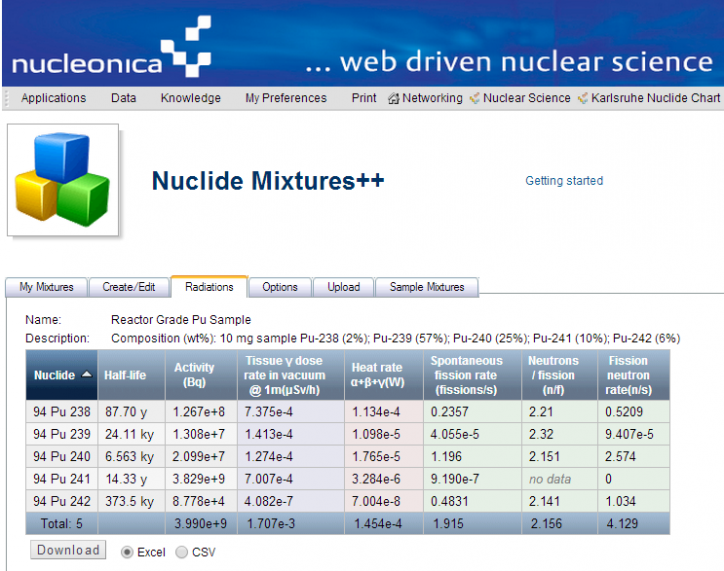 – a new Radiations tab has been introduced to show the “handling” properties for a mixture and its component nuclides. In particular, the gamma dose rate, the heat rate (isotopic power) and the neutron emission rate are given for each nuclide and the total rates for the mixture. – a new Options tab has been inroduced which allows the user to choose the various quantities shown in the Radiations tab. – a new feature – Generate Random Mixture – allows the user to creat a random mixture of (10) nuclides in a single operation. The feature allows for easy random generation of nuclide mixtures and is particularly useful for “stress testing” the various Nucleonica applications. – in the main My Mixtures tab, the check boxes can now be used to select multiple nuclide mixtures. These can then be deleted in a single operation using the Delete selection button. – In the My Mixtures summary tab, a new column has been introduced which gives the nuclear data library (e.g. ENDF/B-VII.1, JEFF3.1, etc) used to create the Nuclide Mixture. Currently, the default nuclear data library is JEFF3.1. In future versions of Nucleonica, the user will have the possibility to select the nuclear data library.